G.R.Barrett & Son - The Motoragents. Homepage. 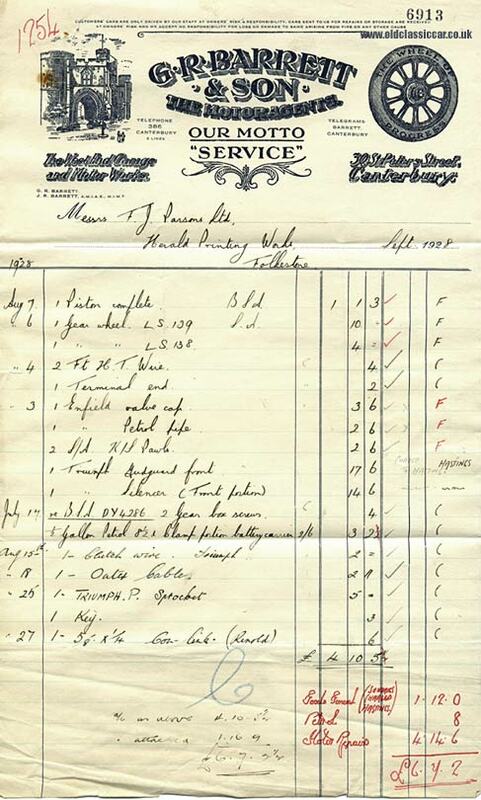 This page: An invoice for work done to a vintage BSA by motoragents G.R. Barrett & Son in Kent. The Motoragents of West End Garage & Motor Works. In 1928, Messrs. F.J. Parsons Limited, of the Herald Printing Works in Folkestone, had a BSA requiring work, and it was to G.E. Barrett & Son - "The Motoragents" - that the work was entrusted. Their business was located in The West End Garage & Motor Works, 30 St. Peters Street in Canterbury. They had a simple motto - "SERVICE" - and evidently were a prominent business in the locality, customers could contact them either by telephone (Tel No. 386 and two lines were available), or else by telegram ("Barrett Canterbury"). Their stylish letterheading not only included the business name, and address, but also a view of Canterbury, and a vintage motor-car's roadwheel, in which the slogan "The Wheel of Progress" was written. The vehicle being worked on at the garage was a BSA motorcycle, registration DY4286. The overhaul appears to have been reasonably comprehensive, the items charged for included a piston, gear wheel, HT wire, silencer, Triumph (?) mudguard, various cables and other oddments. George R. Barrett, a keen cyclist, set up a business selling bicycle and motoring components with George Jackson in 1902. By 1904 however Barrett alone is listed as proprietor of the West End Garage and Motor Works, at the address shown above. In the early days, along with cycles and accessories, Barrett's sold new Ford Model T cars, but in the years following WW1 decided to part company with the blue oval. The garage continued to supply new Rovers and Humbers, as they had done prior to the war. His eldest son John joined the firm in 1922, leading to the business being re-named G.R. Barrett & Son - the name J.R. Barrett is also printed on the above invoice, below the originator's name. In 1927 G.R.B. became the local mayor, and the business continued to thrive. In 1931 the pair bought nos. 28 & 29 Peters Street, alongside the motor premises, and diversified into radio and toy sales, Barrett junior being a keen wireless fan. In 1937 a devastating fire would rip through the shop premises, destroying much of the contents and sadly killing one of the firm's long-term employees in the process. A brand new building was built to replace the damaged originals, and they would continue to sell all manner of products, including toys, motorcycles, and cars. The company survived WW2, despite the best efforts of the Luftwaffe, and in 1946 became Austin distributors for the East Kent region, to partner the ongoing Rover commitment they'd maintained from the early years. The firm continues to this day, in both the motor and audio business, although the presence of new Austin motor-cars in their showrooms is but a distant memory. More motor-trade related invoices are listed in the Motoring Collectables section.